The major national retailers. 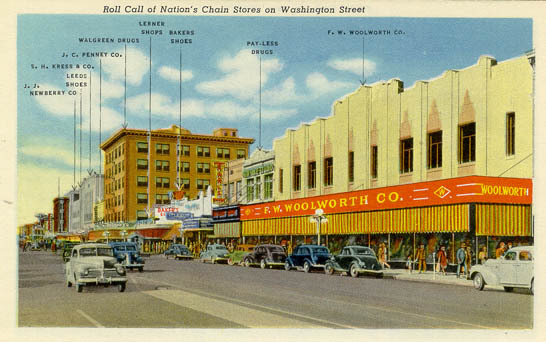 J.C. Penney, Newberry’s and Woolworth’s had emporia there. Coupled with famed local stores like Korrick’s, Mehagian’s Furniture, Rosenzweig’s Jewelers and Porter’s Western Wear. There were no malls, yet. No strip malls. Certainly no shopping centers. And, if you wanted something like jewelry or a firearm, but didn’t have the resources or credit, there was yet another place you could go. A pawn shop. Not just ANY pawn shop, but The Jewel Box. Started by Morrey Resnick in May, 1949, it was located at 41 South First Avenue. Downtown. Later, during so-called urban renewal, it was moved to 601 North Central Avenue, until it closed in May, 2006. Morrey knew how to make money. Not just in extending cash credit at pawn-shop rates, but in selling firearms, both off-pawn and new, to a burgeoning Valley market. Whenever one wanted to see a scarce firearm, one perhaps that had just appeared in Guns & Ammo, and no other local store yet had it in stock – he would have it. Sometimes at twice MSRP, or worse. He also knew that shiny 1911 pistols, with ornate, perhaps overdone engraving, in .38 Super, were craved by a certain audience. Roll stamped on the slide with names like ‘El General’ or ‘El Capitan’, they brought a particularly high price. And he always seemed to have them in stock. When no one else did, or cared to. Like Harry Rosenzweig, Joe Porter and other pioneer local retailers, he brought some of the ambiance that was downtown Phoenix in the 50’s and 60’s. Western-cut business suits and bola ties. Cowboy hats. Until urban renewal, when shopping centers and malls came on the scene. Morrey passed in 2010. He is missed.